This section is dedicated to Twelth Night (correct spelling Twelfth), the play by William Shakespeare. 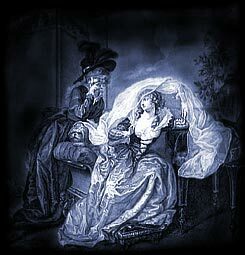 The picture is 18th century and image displayed represents the essence of the play which, we hope, will bring to life a famous scene or character from Twelth Night. The information provided in this section of william-shakespeare.info includes famous quotes / quotations from Twelth Night, summary of the plot or story, facts about the play, a list of the cast and characters and access to the full text - script of the play Twelth Night by William Shakespeare. Shakespeare loved to use the device of mistaken identity, and nowhere does he use this convention more skilfully than in Twelth Night. Viola, surviving a shipwreck, walks ashore at Illyria, and immediately embarks on a gambit to allow her to make her way in a world of men. Dressed as a man, Viola, now Cesario, insinuates herself into the service of the Duke of Illyria, Orsino. Orsino longs for the love of a neighbouring countess, Olivia , who as she is in mourning for the death of her brother, repels his advances. When Cesario (Viola) undertakes Orsino's bidding and gains admittance to Olivia's chamber, she becomes infatuated with the messenger. Viola (Cesario) then falls in love with Orsino. To add to the farce Viola's (Cesario) identical twin, Sebastian arrives on the scene. Sebastian has also survived the shipwreck, although Viola thinks he has drowned. Sebastian has been rescued by a sea captain, Antonio. But Sebastian is sad, for he believes his twin sister has drowned. The kindly Antonio gives him money to get along in Illyria but remains behind for the time being because the Illyrians think he is a pirate. Living in Olivia’s household is her uncle, Sir Toby Belch, a merry character. Belch pretends to promote Sir Andrew Aguecheek as Olivia’s rightful suitor. Belch just wants to use Aguecheeck' money. The steward of the household is the conceited Malvolio. Late one night Belch, Aguecheek and Olivia’s jester, Feste, are drinking and singing as they often do. Olivia's handmaiden, Maria tries to quieten them but they take no notice. Malvolio catches them and blames Maria for allowing them to behave so badly in Olivia's house. Maria and the others plan to gets their own back by forging a love letter from Olivia to Malvolio. More confusion ensues with jealousy, mistaken Identity and fights and duels. Sebastian and Olivia fall in love and marry. Orsino realises that it is Viola that he loves and she agrees to marry him. Sir Toby Belch and Maria also decide to marry! Twelth Night ends and everyone, except Malvolio, is happy and Shakespeare speaks of the madness of love. The first recorded production of Twelth night February 2 1602. In the Elizabethan era there was a huge demand for new entertainment and Twelth Night would have been produced immediately following the completion of the play. It is believed that Twelth Night was first printed in 1623 in the First Folio. As William Shakespeare clearly did not want his work published details of the play would have therefore been noted, and often pirated without his consent, following a performance. The number of words in Twelth Night, according to the Complete Public Domain Text is 21,467. The quotes from Twelth Night are amongst Shakespeare's most famous including 'some are born great, some achieve greatness and some have greatness thrust upon them'. Details of this famous and other quotes follow, complete with information regarding the Act and the Scene, allowing a quick reference to the section of the play that these quotations can be found in. Please click here for the full text of the script of the play. There is no historical connection to the play, it is all purely fictional. Shakespeare's main source for Twelth Night was probably Farewell to Militarie Profession (1581), by Barnabie Riche.